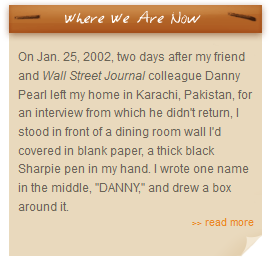 Georgetown University's Pearl Project has enabled students to learn the techniques and methods of the best of traditional investigative journalism as well as cutting edge computer-assisted reporting techniques. Our faculty-student investigation broke new ground in reporting the kidnapping and murder of Wall Street Journal reporter Daniel Pearl, interviewing current and former officials from the FBI, the CIA and Pakistani intelligence, government and law enforcement. The course was a life-transforming educational and professional experience for the professors, students and volunteers involved in the project. We are deeply grateful to the Ethics and Excellence in Journalism Foundation for believing in the vision with which we launched the project. We could not have realized the success we have seen without the generous support of the foundation. Provide a safe haven for journalists who have experienced a lack of press freedom in the form of censorship, threat to personal safety or other methods of intimidation or recrimination. There is a pressing need for this. Journalists are being killed or threatened at record numbers in the world today, and it's critical that we send a clear message that we will not be deterred. Also, investigative reporting efforts are fading in the new world of media consolidation, and it's vital that we keep this important expression of journalism flourishing. Future projects will focus on journalists at risk in their home country because of press freedom issues or journalists slain in the line of duty, like Daniel Pearl, whether on the battlefield or a street corner. The pedagogical and journalistic approach of the project's work will be modeled after the first Pearl Project. Influenced by the ideal of helping individuals become who they were meant to be, we believe that investigative journalism is a calling. Practiced in its truest, purest form, we consider investigative reporting a noble enterprise worthy of the next generation of the best and brightest student journalists. For journalists living in dangerous, repressive or fragile civil societies in which freedom of the press is not yet recognized as a fundamental right, we hope to someday have the means to offer a safe haven in which to do their work. For our colleagues who have fallen, we hope our projects will honor them in the best way we know how: by continuing their work. And for our next generation of investigative reporters, the project will be a training ground. We hope our projects will keep alive the rich tradition of investigative journalism. It will serve as an insurance policy for the work of journalists everywhere.